One of the most useful and powerful tools a homeowner can have is a chainsaw. These power tools can help you complete jobs more efficiently and quickly. You can trim bushes, fell trees, and cut firewood easier than before. They are amazingly versatile machines. However, chainsaws can be dangerous. Every year, chainsaws injure tens of thousands of people. These injuries can be severe and even fatal. Some of these accidents happen because people buy a chainsaw that’s not very well suited for them. 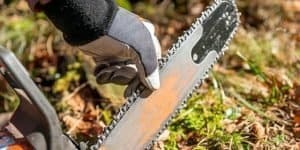 You can avoid these potentially lethal mistakes by buying the right chainsaw for you. 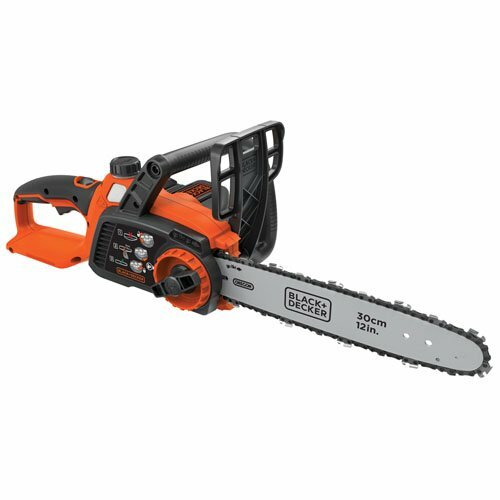 What is the Best Chainsaw for the Money? Which Chainsaw Chain Type Is Right For me? Top Handle Chainsaw or Rear Handle Chainsaw? The most important step to preventing a serious injury is to purchase the correct chainsaw in the first place. It’s important to choose something you can operate, and that is right for the job you want to complete. Spending more money doesn’t always mean you are buying the right machine for you. It might mean you will end up buying a chainsaw that is too much for you to handle, thus becoming a potentially lethal danger. 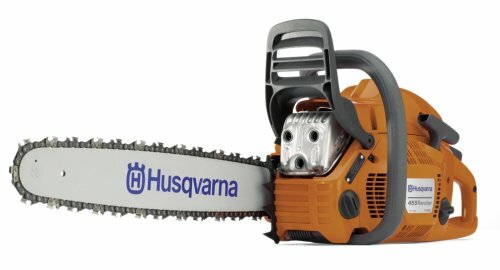 What is the best chainsaw? That depends on how you will use it, what you will use it for and most importantly, your experience level and physical ability. Luckily, the best chainsaw is not always the most expensive. You can get the proper tool for the job without breaking the bank. This guide will help you make the right decision and find the best chainsaw for the money. As you may know, chainsaws are not all the same. What is the best chainsaw? That depends on how you will use it. Before you choose the right model, think about these buying considerations. Chainsaws are powerful tools, and that power can come in three different forms: gas, electric, and battery. Each of these kinds of chainsaws has its benefits and drawbacks. 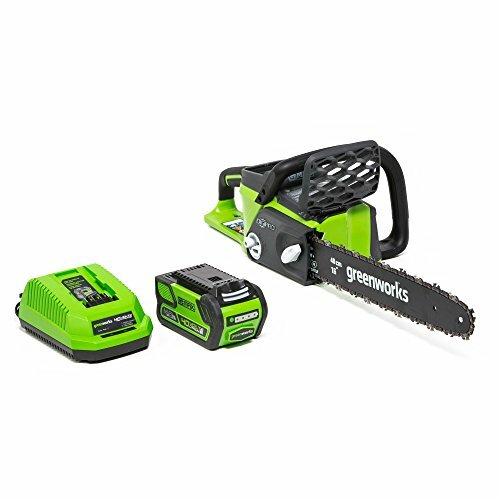 Before you can decide what is the best chainsaw for you, you must choose a power source. This is by far the most important factor. Most people will have a pretty good idea which power source will suit them best. However, for those people that aren’t quite sure yet, we will trade into a little more detail. 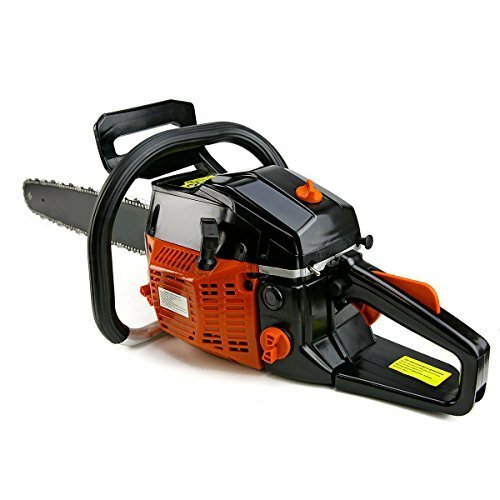 If you want to cut down trees with the most professional and commanding tools available, you may choose a gasoline-powered chainsaw. This style relies on a mixture of gasoline and oil to give you maximum power. If you intend to use your new tool for big, demanding jobs, this is the best chainsaw type for you. When you rev up a gas-powered chainsaw, you can expect lots of torque. They are ideal for cutting lots of firewood or felling large trees. Furthermore, you don’t have to worry about extension cords or staying near an outlet. However, there can be some downsides to this choice. Gas-powered chainsaws tend to be harder to use for beginners. The power can be more than expected. The weight can cause you to tire more quickly. This can be a danger, people tend to make more mistakes when they tire. Gasoline saws are heavier than their electric counterparts. The extra weight of the gas and oil can cause your arms and back to tire more quickly. This exhaustion can be a danger because people tend to make more mistakes when they tire. These machines also tend to be harder to use for beginners. The power can be more than they expected. Furthermore, if you will need to turn the saw on and off a lot, it could be frustrating because they can be awkward to power on. Sometimes, you must pull the string just right to get it to go. 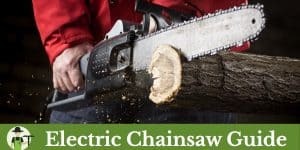 Finally, you may have to sink more money into maintaining your gas-powered chainsaw than you would if you got an electric version. A gas chainsaw is the only option if you need maximum torque to get the job done. However, if you’re working on smaller jobs, you may consider these to be downsides. If a gas-powered saw sounds too cumbersome or like too much work for what you need, don’t worry. An electrical tool may prove to be the best chainsaw for you. These tools are perfect for doing basic yard work. 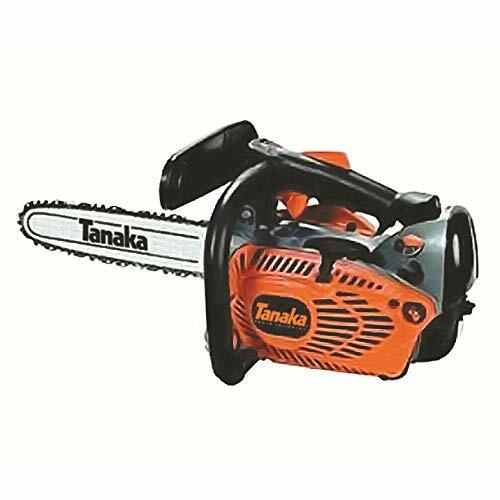 Because they are lighter than other kinds, this type can be the best chainsaw for home use. This section is merely a summary of a more in depth article I have written about corded electric chainsaws. 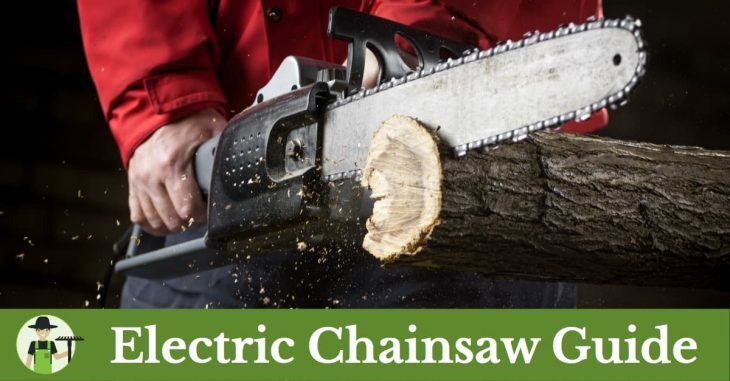 If you have some small branches you need to cut through or some trimming to do, an electric chainsaw will allow you to get the job done easier and more safely than its gas-powered counterparts. Electric versions have less power, which can mean less kickback, which is the primary cause of injury. Electric chainsaws are also easier to start. You can get going with just the push of a button instead of yanking on a cord and hoping for the best. As you can see, there are plenty of great reasons to choose an electric chainsaw. However, there are some downsides to consider. You can get going with just the push of a button. However, an electric saw will not have the same power as a gas model. First, an electric saw will not have the same power as a gas one. If you need a powerful tool for big jobs, an electric chainsaw isn’t the right choice. The second major drawback to these saws is the cord. You must have it plugged into a generator or other power source the whole time you work. The extension cords can get tangled and can even be dangerous as a trip hazard. If you’re staying near your home, these saws can still be a great option. However, they won’t work for jobs that require portability. 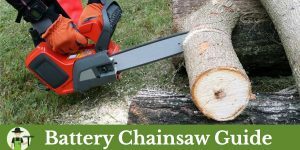 If you want the safety and convenience of the electric saw and the portability of the gas option, a battery-powered chainsaw may be right for you. In years past, these tools were unpopular due to their lackluster power. However, improvements in battery technology have increased the torque in these chainsaws. This section is a summary. We have a full article on battery powered chainsaws which goes in lots more detail. If you choose this type of chainsaw, look for one with a lithium-ion battery. These are lighter weight and stronger than the nickel-cadmium alternatives. You can use voltage to measure the power of individual battery chainsaws. The higher the voltage, the more torque you get. You should not use battery-powered chainsaws to cut down large, robust trees. 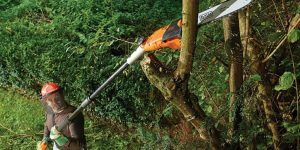 This option is better for smaller pruning jobs and cutting off skinnier branches. Best of both worlds. Power is indicated by voltage. The higher the voltage, the more powerful the chainsaw. As you can see, power and its source matter when it comes to deciding what is the best chainsaw. However, it’s not just about torque. The weight of the machine and the length of the guide bar are both important considerations as well. These three elements intertwine to create varying tools. When deciding how much power you need from your chainsaw, consider what you will use it for. If you’re chopping tough or thick wood, you may need something with serious torque. 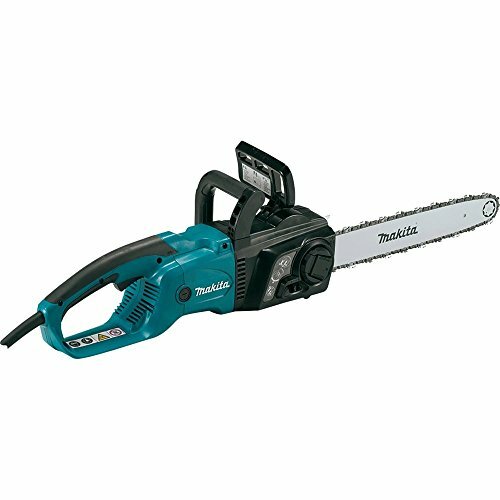 However, if you only mean to use it to trim some smaller branches or trim back bushes, such power may be unnecessary. For gas chainsaws, you can measure the strength of the engine with cubic centimeters (cc). The larger the number, the more torque the chainsaw will give. With electric engines, this figure will be in Amps, and it is Volts in battery saws. To choose the optimal weight of your new machine, consider what you feel comfortable carrying around for the duration of the job. For example, if you have a bad back or hurt shoulders, you will want to choose something lighter. However, regular weightlifters may be able to handle heavier chainsaws. Even a 12-pound saw can be incredibly difficult for someone who isn’t in tip-top shape to use. While it may not seem heavy at first, your arms can get tired during your project. Tired arms are a grave danger that can cause you to lose control of the saw. For gas chainsaws the power is measured in cc and horsepower. For corded-electric it’s Amps, and for battery-powered saws power is indicated in Volts. The next consideration is the length of the guide bar. This measurement starts at the tip of the chain and stops where the chain goes back into the housing. If you prefer to cut through the wood in just one pass, choose a chainsaw with a guide bar that is about two inches longer than the wood you want to cut. Don’t be fooled into thinking that shorter guide bars cannot do big jobs. With two passes, a chainsaw can occasionally cut through something twice its bar length, but you shouldn’t use it this way regularly. It’s important to consider what you will use the chainsaw for to decide the right length. If you intend to use your new saw for pruning around the home, choose a guide bar length of 12 inches or smaller. If you want to fell a small tree or do some light limbing, 12 inches to 14 inches will do the trick. For trimming jobs, the guide bar should be no longer than 16 inches. If you’re just going to do some light firewood cutting, 14 inches to 16 inches will be okay. However, if you’ll be doing more heavy wood work, consider something from 16 to 18 inches. Felling a medium tree requires a guide bar between 16 and 18 inches long. Finally, for bucking use something 18 inches or more. 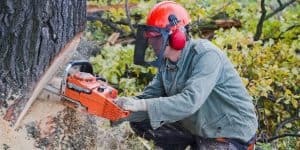 To understand the safety risk of any chainsaw, you must comprehend these three elements and the way they interact. Kickback is the primary safety concern when it comes to chainsaws. The longer the guide bar is, the more likely kickback will be. Likewise, the more powerful the chainsaw is, the more powerful the kickback will feel. Finally, the heavier the chainsaw, the more difficult it will be to control if kickback occurs. So, a heavy, powerful, and long chainsaw is the most dangerous. No matter the type of saw, you should always handle it with care. Another important feature on any chainsaw is, of course, the chain. These can come in several sizes and types. However, unless you are a seasoned professional, you should choose an anti-kickback chain. These chains are on the best homeowner chainsaw models and are safer. Not all anti-kickback chains are the same. They come in different sizes to fit the guide bar. Furthermore, it’s important to choose a chain that allows you to adjust to the correct depth gauge for the type of wood you intend to cut. The depth gauge refers to the depth the tooth reaches with each cut. You should choose a smaller depth gauge setting when cutting hardwood and a larger setting for softwood. However, if there is frost on the softwood, this may not apply. The easier it is to adjust your chain / gauge, the better you may like your new saw. The most important thing is to always keep your chain sharp. Not sure how to do this or tell whether it’s sharp or not? Read our guide on how to sharpen a chainsaw. The final buying consideration that I will cover is the type of handle. You can choose between rear handle and top handle chainsaws. However, a rear-handle chainsaw is by far the best chainsaw to buy for home use. This style is best for cutting on the ground. When you shop around, you will probably find more rear-handle models. Top-handle chainsaws are meant for professionals who cut while in the tree or a harness. Chainsaw manufacturers recommend that only trained professionals should use this type of saw. 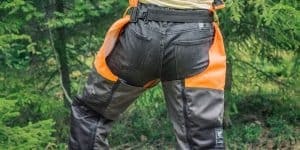 The main reason for this is, that whenever kickback occurs on a rear-handle chainsaw, it will be near impossible to control because of the lack of leverage. Be sure only to purchase a top-handle saw if you have lots of experience with chainsaws. In addition to the essential features and styles described above, there are some extra features that some chainsaws have. These add-ons can be useful in certain situations and may help you choose one machine over another. Anti-vibration features are ideal for beginners and professionals alike. By keeping the vibration to a minimum, this feature allows you to keep working with less pain. You may also consider a chain brake, which protects your front hand against kickbacks. This is important if you want maximum safety. An automatic oiler is a great feature that keeps the chain oiled so that you can continue to cut efficiently and safely. You should also look for anti-kickback chains and guide bars. These features help keep you safe. Remember that kickbacks are the leading cause of chainsaw injuries. Tool-less chain adjustment is a benefit that simply makes your life easier. Instead of breaking out the toolbox and looking for specialized tools to adjust your chain tension or bar, you can only turn a few knobs. Likewise, a spring-assisted start makes chainsaw jobs a lot easier because you can start gas saws. Another feature to think about is bucking spikes. These go right where the saw and housing meet and grip the wood to prevent kickback. All of these features can make your job safer and easier. Once you have considered these chainsaw features, your choice mostly comes down to brand preference. Each brand of chainsaw offers different things that you may want to consider in your purchase. First and foremost is cost. Some people may have an emotional connection to a brand. They will probably buy a model of this brand without reading too many reviews. They have a good feeling about ‘their’ brand. There’s nothing wrong with that. If you already own a battery powered tool, it’s worth looking into the product line-up of this brand first. Some brands allow you to buy tools without the batteries. You may be able to use the battery of the tool you already own. This save you lots of money, as the battery is often the most expensive part of the machine’s value. Make sure your battery will fit though. It needs to be the same voltage and physical fitting. Savvy consumers want to buy the best chainsaw for the money. No doubt the upfront cost is a major part of this decision. However, there are more hidden fees that you should consider before making your purchase. Be sure to evaluate all of the costs below first. First, consider the brand’s reputation. If the brand in question is known for making long-lasting machines, you will likely get more bang for your buck. On the other hand, if reviewers say that the brand often meets an early end, it may not be worth a cheap price tag. The best chainsaw brands have glowing reviews. Together with the brand’s reputation is its warranty. The longer the warranty, the more likely your new purchase will last for years to come. A good warranty also shows that the brand stands by their product. It’s important to consider this when finding the best chainsaw for the money. You may also think about the availability of the parts for your new chainsaw. Even the best tools in the world can break down from time to time. When that happens, you may want to find replacement parts rather than make a whole new purchase. However, if the chain and other parts for your saw are rare, this could prove to be difficult. Consider getting a chainsaw from a brand that has replacement parts readily available when you need them. This way, you don’t get stranded in the middle of a job waiting for parts to come in. Finally, think about what you will do if you need to get your new machine serviced. Will average repair shops take it or will you have to shell out for a specialty repairperson? There are many considerations to keep in mind when you think about cost. You’ve seen that there are plenty of features that set chainsaws apart. To put this knowledge to use, ask yourself a few questions so that you can find the best chainsaw for you. First, think about the primary use of the chainsaw. The answer to this question can help you determine the right weight, power type, and length of the chainsaw. For example, if you’re doing some basic yard work, you can choose a lighter electric chainsaw with a shorter guide bar. Next, be honest about your experience level. Remember that only professionals should use top-handle chainsaws. You may also think about your physical fitness to determine the right weight for you. Newcomers should consider a lighter, shorter and less powerful tool for more safety. How often will you use your chainsaw? If you intend to cut firewood daily, you should consider a heavy-duty model. However, the occasional trimming and pruning may not require such a tool. Finally, consider your environment. If you use the chain indoors or near sensitive neighbors, consider an electric model since they make less noise than others. 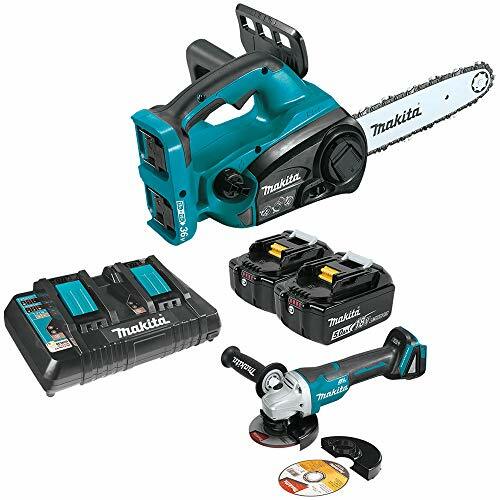 However, if you’ll be far away from a power source, a gas or battery chainsaw would be best because they are more portable than electric versions. These questions will help you determine what the best chainsaw for the money is and what model is right for you. It’s important, to be honest with yourself in answering these questions so that you can make the right decision.